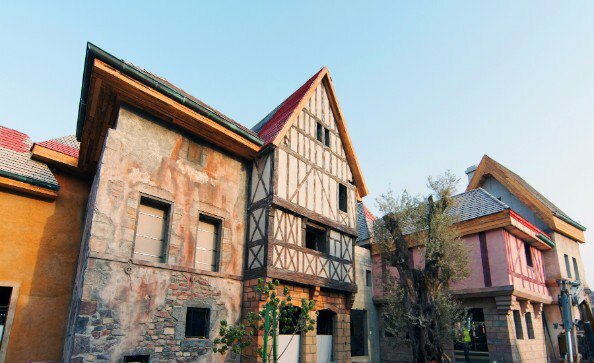 It might look like it’s been lifted from the set of Beauty and the Beast, but this quaint, countryside-style setting is actually right here in the UAE. 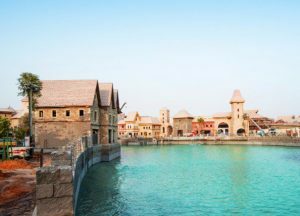 Riverland at Dubai Parks & Resorts has become the first place to contain a man-made river within a theme park destination in the region, and shots of the idyllic retail hub have just been unveiled. The one-kilometre stretch of river isn’t completely full yet, but it’s slowly filling up ahead of Dubai Park’s opening date of October 31. Once Riverland is open, visitors will be able to take boat rides, or enjoy a meal on the waterway’s banks in one of four themed zones: The French Villages, Boardwalk, India Gate and The Peninsula. Riverland is the connector between the three on-site theme parks and the LEGO water park. It doesn’t require a ticket to enter, either. Inside, you can find more than 50 different restaurants and retail outlets, as well as street theatre, performers and more. When Dubai Parks & Resorts opens, visitors can make the most of four different theme parks in one destination, including the LEGO Family Park, LEGO Water Park, Hollywood-themed Motiongate Dubai as well as Bollywood Parks Dubai. There’ll be over 100 rides and attractions, including live shows, 3D motion simulators, roller coasters, drop towers, a water park and family zones. All of that will be spread over a massive 25 million square feet of land. One day pass is Dhs280 for children and seniors. One day pass is Dhs245 for children and seniors. Dhs430 for children and seniors, Dhs480 for adults. Dhs650 for children and seniors, Dhs730 for adults. Dhs765 for children and seniors, Dhs870 for adults. Dhs790 for children and seniors, Dhs890 for adults. Motiongate is still undergoing some construction, so for two months after the opening on October 31, a discounted price of Dhs210 for children and seniors and Dhs240 for adults will be offered. You can get VIP tickets for Dhs1,500 per park per day. VIP Tickets will allow you to queue skip, get you a personal tour guide as well as food, beverage and retail discounts.